Around La Paz, the capital city of Mexico’s Baja California Sur, locals are known as Los Paceños. The “Peaceful Ones,” visitors quickly discover, are proud to show off the culture, arts, and cuisine of their city — a trait that keeps the heart of La Paz beating strong even as the bigger and louder tourist towns of Mexico succumb to development. Many come for whale watching season — but that is far from the only reason travelers should escape to La Paz. Perhaps you’re seeking an experience only offered in truly authentic coastal towns, or maybe just a haven hideout from the region’s strikingly cold winds. No matter the reason, a trip to this laid-back capital town is worth the visit. There are two main options for getting to La Paz: Fly into San José del Cabo and commute two hours north, or fly from Mexico City into La Paz. Flights from major US cities to Los Cabos can be as little as $350 and up to $550. To Mexico City, flights are often slightly cheaper at $200 to $450, and the connecting flight to La Paz can range from $60 to $160. After landing in Los Cabos, it is easiest to coordinate hotel and transfer services through EcoBaja Tours, which will pick you up and deliver you to your destination, be it the airport to the hotel or the hotel to your day-trip destination. 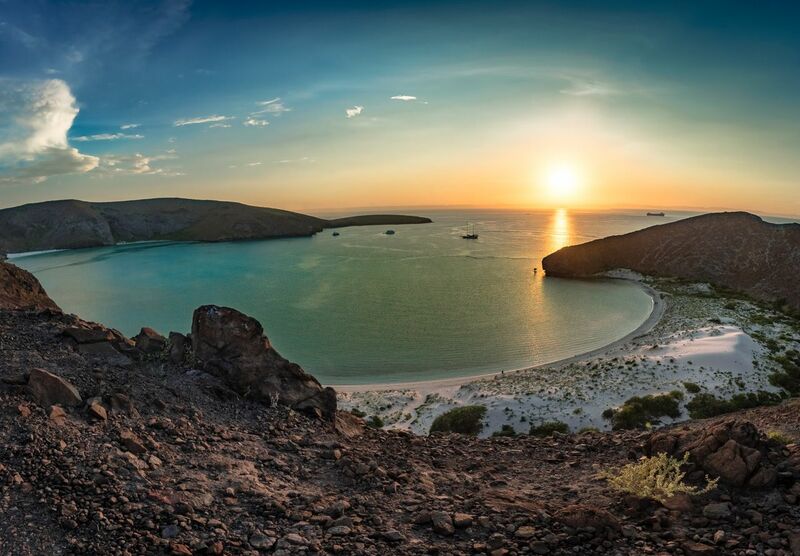 Camp Cecil elevates “glamping” by setting up camp on Isla Espiritu Santo, an island within Espiritu Santo National Park, a UNESCO World Heritage Site in the Sea of Cortez. Guests are picked up at the airport or in Todos Santos and transferred across both land and sea to their retreat. Each tent features real beds, nightstands, chairs, linens, lanterns, towels, and rugs. Eco-toilets and showers are onsite and close enough to the real thing that adventurists will not even notice the difference. The resident chef prepares all meals and happy hours at the campsite’s Espiritu Xantus Café. Reservations are $350 per person per night, which includes transportation, all meals, accommodations, and gear for kayaking, snorkeling, or paddleboarding. Check out the video below to get an idea of what it’s like to stay at Camp Cecil. Costabaja Resort & Spa claims to be the first luxury hotel and spa in La Paz, though it is actually located on a small peninsula 10 minutes north of downtown. The resort hosts six restaurants, a fitness center, an infinity pool, a second pool with a swim-up bar, a shuttle that transports guests to the city center, and expansive views of both the Sea of Cortez and the cacti-dotted desert. Rooms average $140 per night. Hotel Catedral is budget-friendly and located in a quiet but convenient nook of downtown. Local coffee shops, restaurants, art, the beach, and malecón promenade are a short walk. The minimalist-chic interior is clean and features a rooftop bar and pool that overlooks the neighboring cathedral. Rooms are typically $75 per night. Wake up early for the cheapest and most authentic breakfast in town at the Mercado de Municipal General Nicolás de Bravo. Though there are several to choose from, this market offers the most and operates daily from 6am to 4pm, with the exception of Sundays when it closes at 2pm. Arrive at Gorditas El Cacheton shortly after opening at 7am to beat the crowd. Try a chile relleno taco or an empanada made fresh each morning ($1.35-$4). Take lunch along the malecón at Bismarkcito with a breeze and a view of the bay of La Paz. Opening as a street cart in 1968, the restaurant now operates out of the three storage units it purchased to keep up with demand. 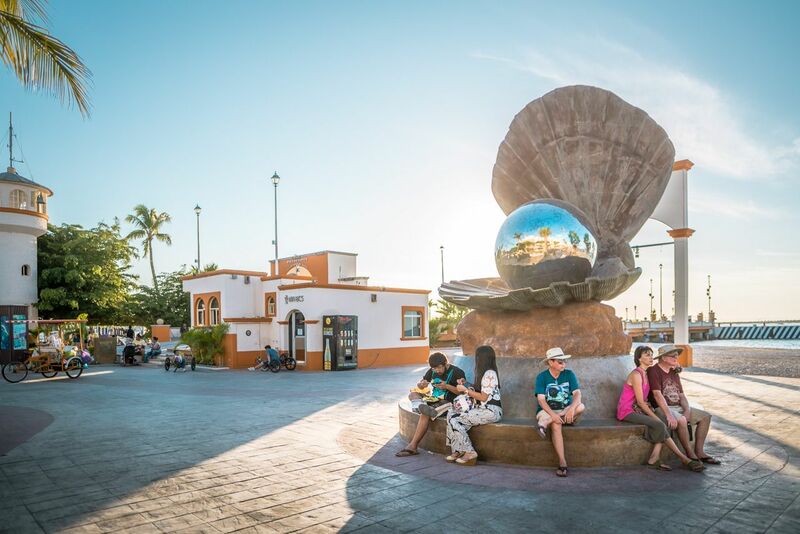 Although known for its tacos, the stuffed chocolate clams, a local delicacy and some of the largest bivalves one can eat, is the dish to order ($5-12 for small to large entrées). Located inside the expansive Costabaja Resort, Azul Marino skims the marina. It’s owned by two sisters — the fish served each night is caught by one and prepared by the other. Visiting fishermen and women can also bring their own catch of the day to be prepared. For a leisurely dinner, start with the fish tartar and end with crème brulée ($11-30 for mains). End the day with a nightcap of mezcal tastings at La Miserable, an artful dive bar complete with a resident cat that presides over the cash register. Most are familiar with tequila, but its smokier cousin mezcal is rapidly growing in popularity. A two-ounce pour starts at just under $4, but beer can also be ordered for as little as $1 or as much as $4 for local craft brews. Day trip to Todos Santos, an artist town. Located at the halfway point between La Paz and Los Cabos, this easy day trip is an essential desert-oasis experience, surrounded by a red, dry landscape. Visitors will know they have arrived when greenery pops up outside the car window. From art galleries and stores displaying handcrafted silver products to locally roasted coffee and freshly made pastries, the colorful facades and papel picado strung above the streets are a scene worth the drive. Visit Balandra Beach. At the northwesternmost point of the peninsula extending from La Paz, this beach has one beloved and renowned feature: the mushroom. Though it was once a free-standing phenomenon, the bizarre rock formation crumbled and had to be rebuilt after it was climbed by a visitor. The white sands and aquamarine waters hold their own as far as tourist vistas in the area. Bring plenty of sunscreen and water, because a full day is barely enough time to take in this contrast to Balandra’s rocky alcoves. Go SUPing in the bay of La Paz with Harker Board Co. after a day of lazily soaking up rays. Guests can rent equipment or take a class. It’s a great way to spot a stingray or sea turtle. 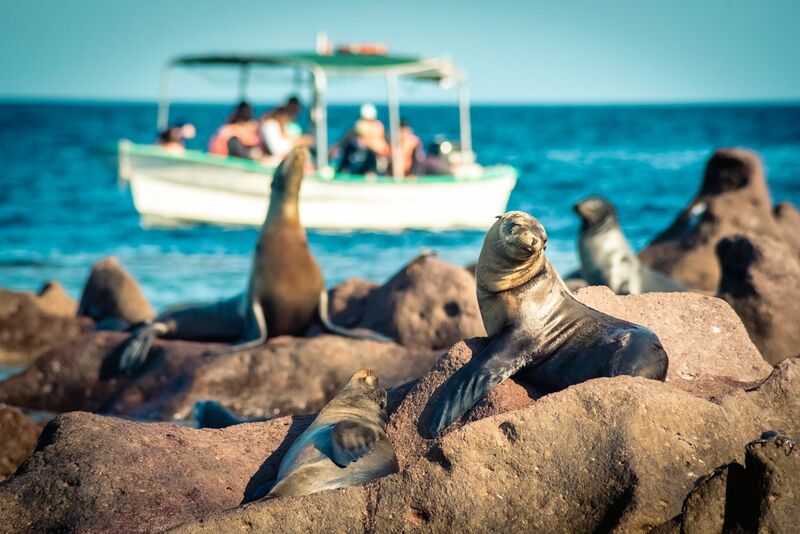 La Paz is a famous destination for diving with whale sharks and sea lion pups, but from December to April, gray whale watching takes precedence. The 30-ton animals migrate to the area to mate or give birth. Whales are easily spotted in the Sea of Cortez near La Paz, but for a memorable experience drive the 3.5 hours north to Puerto López Mateos. Choya Tours are led by marine biologists and will stop for breakfast in Ciudad Constitución before arriving in López Mateos, the Magdalena Bay marina. It’s estimated there are 400 gray whales in the bay during this time of year. From the small boats, guests can often pet mothers and their young as they linger at the vessel. Stop at the Museo de la Ballena back in La Paz to learn more about the evolution and conservation of whales in Baja California Sur. Both English- and Spanish-speaking guides are available to discuss the largest mammals in the ocean. Travelers who feel inspired to take action can aid gray whale and sea turtle research with Red Travel Mexico.